At this point in the Marvel Cinematic Universe (MCU), I feel these movies are practically on autopilot. Because Thor (Chris Hemsworth) and the Hulk (Mark Ruffalo) were absent from Captain America: Civil War (2016), there had to be a movie to explain what they were doing during that timeframe. Consequently, while Civil War had great conflict and an epic battle sequence, Thor: Ragnarok (2017) feels . . . less necessary. This being said, I do think that Ragnarok explores the Thor universe better than Thor: The Dark World (2013) did, thus making me wonder if Dark World was truly the unnecessary film. Sure, there are little snippets here and there in these films that set up other parts of the franchise (mainly, the Infinity Stones that will lead to Avengers: The Infinity War (2018)), as well as minor cameos that are fun, if not wholly filler (Doctor Strange (Benedict Cumberbatch) in the case of Ragnarok). All Ragnarok seems to do is set the stage for the next big film in the franchise. That’s not to say it’s not fun and entertaining. There is plenty that Thor: Ragnarok has going for it, that’s for sure. At the very least, it probably won’t be relegated to a two-minute play put on for Asgardian royalty. While being bright and colorful, there were still enough moments of character development that concluded in a flashy spectacle. 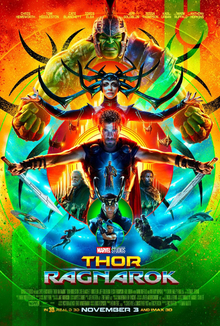 Where Dark World brought humans to Asgard, thus necessitating Thor’s eventual return to Earth, Ragnarok explored the universe connected to Asgard in a way that helped to develop the MCU. The humor in Ragnarok was also on point, with Jeff Goldblum’s Grandmaster and Taika Waititi’s Korg being some of the best dialogue in the film. I also enjoyed the minor cameos of Liam Hemsworth and Matt Damon in a “blink and you’ll miss it” moment. An entertaining setup for greater things to come, I give Thor: Ragnarok 3.5 stars out of 5.